YEREVAN—Armenian Revolutionary Federation Supreme Council of Armenia representative Armen Rustamian on Tuesday laid out his party’s vision for the post-election popular movement in Armenia by stressing the importance of securing a victory at the Yerevan municipal elections set for May 5, as a stepping stone toward achieving regime change. Speaking at a rally on Freedom Square on March 5, Rustamian noted that the authorities will not willingly compromise, let alone concede power. “Only a popular movement that transforms into a powerful political factor can force them to do that,” he said. According to Rustamian, The final objective of the movement is to guarantee that the people assume power on all levels. That objective can best be attained through persistent struggle, by securing a series of victories. We should not get disheartened if we cannot achieve regime change right away. We can attain that goal gradually, he noted, adding that every single person in the movement will have to work towards that goal. Rustamian concluded by saying that securing a victory during the May 5 municipal elections in Yerevan constitutes the first step. In a country like Armenia, assuming municipal power in Yerevan would be very significant and would force the authorities to make greater concessions, he argued. Meanwhile, at the same rally opposition leader Raffi Hovannisian pledged that there will be “no retreat” from the popular movement sparked after the February 18 presidential elections. “Nothing will make us deviate from our path,” he told the thousands assembled at what has become a regular occurrence as the popular movement continues to grow. Hovannisian also condemned the international community for accepting the official results of the disputed February 18 election. He said congratulatory letters sent to Sarkisian by the U.S. and Russian presidents as well as other foreign leaders were a “huge mistake,” reported RFE/RL. 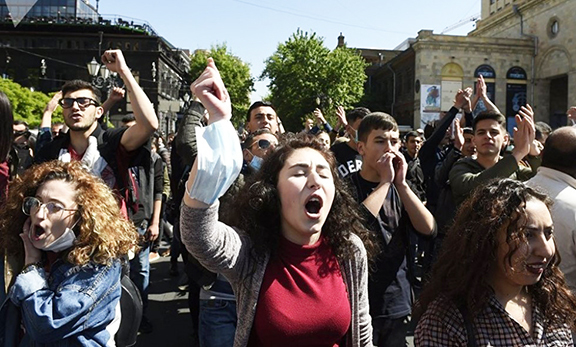 Hovannisian announced that he will tour more areas outside Yerevan, including the cities of Gyumri and Vanadzor, on Wednesday and Thursday before holding fresh rallies in the Armenian capital on Friday and Sunday. Speaking at Tuesday’s rally, Hovannisian assured supporters that Sunday will see a “breakthrough” in the realization of his post-election “program.” He did not elaborate. I don’t understand what’s the ARF’s role in this Barevolution.The credit goes only and only to Raffi. For me it’s very disappointing to see ARF,after more than 20 years since independance,joining and following a movement inspired by a sole and charismatic politician called Raffi. What happened to the leadership and the LEADING? This is an example of byzantine politics in the XXI century. Raffi is not accepting the result. Why ?. Is he absolutely certain he won the election ? Now the dreaded word ” regime change” is uttered. Regime change is a trade mark of the americans; it would be folly to extrapolate it in the context of Armenian politics. It is patently clear that Raffi did not win the election; he should stop creating turmoil and accept the result and and be a constructive opposition. What is the Raffi party going to change politically?. To an outsider this is typical of a natural and normal political rivalry in which the voters had the last say. Organizing rallies? Do people have no other things to do than attend rallies on a daily basis. ?